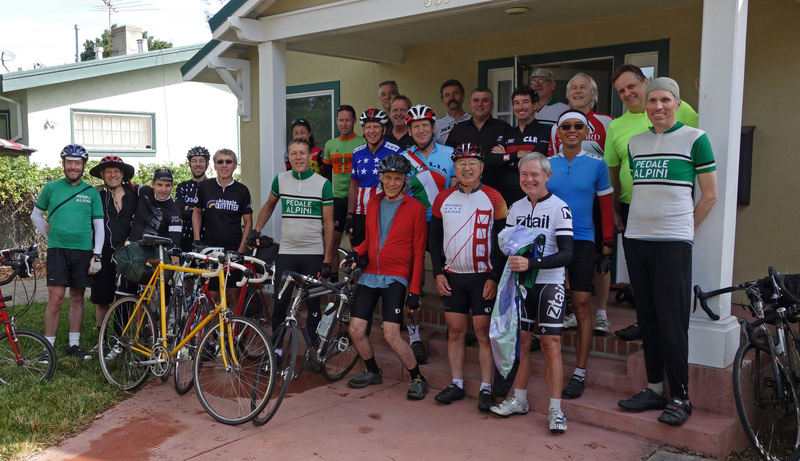 On Saturday we gathered at the hallowed steps of the house of Jobst on Middlefield Road in Palo Alto for a tribute ride and gathering to celebrate our friend’s adventuresome life. I can’t begin to identify everyone in the photo, but we had Jobst Riders there going back to the 1960s! Many riders braved dirt Alpine Road, Jobst’s favorite route to Skyline Boulevard, even though they hadn’t ridden there in decades. Everyone managed to make it up the narrow, bumpy trail with plenty of time to spare for the celebration. The big yellow bike in the front is Jobst’s old one with a repaired rear stay, owned now by Richard Mlynarik. So now it’s time for everyone who isn’t riding to get back on and pick up the pace. Jobst wouldn’t have it any other way. This entry was posted on June 20, 2015 at 7:51 pm and is filed under Ride reports. You can follow any responses to this entry through the RSS 2.0 feed. You can leave a response, or trackback from your own site. you folks are my heroes……for the record. Way to keep the tradition alive! Bravo, Ray. Thanks for posting this. Thanks for this post, Ray, and thanks to all who gathered today to remember and commemorate our larger-than-life friend and visionary. I hope these rides will continue and I can join you. Ray, thanks for organizing Saturday’s ride.